most part anyway. Clever shooters keep coming up with better, heavier bullets; faster twist barrels and higher energy powders to boost performance. become. But those of us that shoot in the Match Rifle Category often find ourselves out-gunned by bolt action .260’s and 6mmX’s (or one of it’s other variants). In some parts of the country, where ranges are protected by tree lines, or the wind just doesn’t blow much, a .223 works fine. But, if you live in the West, Southwest or if you frequent places like Raton, NM; Phoenix, AZ; or even Camp Perry, Ohio, you know that the .223 is a bit lacking. Many of us have looked at AR10’s, but find them too large; heavy; poorly balanced; and expensive (though there are some less costly ones being offered these days). 6mm PPC’s, and found both of them lacking. Either will out perform the .223, but they won’t keep up with the bigger guns. Along with the inadequate performance, they also had magazine problems. None of the factory mags would feed more then 3 rounds reliably without being modified heavily. This may not be a problem anymore. There are some new magazines coming out soon that should end this problem. After those experiments I went to shooting an AR10. First in 6.5-08 (.260Rem.) then followed by a 6mmX. I’ve had very good results with both cartridges and recommend them to anyone that is willing to shoot an AR10. Although I am quite happy with the AR10, I have found that most shooters aren’t comfortable shooting this larger rifle. surpasses the .223 and comes up much closer to the full sizes bolt guns. The first is the 6mmBR. this is a little brother to the 6mmX, that can push a 107 grain Matching within 300 fps of its larger sibling (see above chart). I’ve been playing with this for a couple of years, and it performs very well out to 600 yards. It does have a couple of drawbacks though, first the rims must be turned to the same diameter as a 7.62x39 (or PPC if you prefer). (I have rim cutters for a lathe available, or I will turn the rims for a small nominal fee.) The other problem is again magazines, but it is not as big a problem. Thermold 30 round M16 magazines can easily be shortened and made to work. Also, in late 2004 I should have magazines designed for the BR case available. I haven’t had a great deal of time to play with this one yet, as the brass and magazines are just hitting the market. Hopefully by the end of the year they will be readily available. The little testing I’ve done, did show it will push the Norma 130 grain Match bullet at 2500 fps, atop 28.0 grains of 4895. This will provide very good 600 yard ballistics. performance. The drawbacks though are the same as the other BR cartridges; no magazines yet and the rims need to be turned. 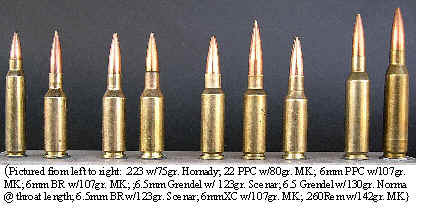 factory magazines, I’d recommend the 6.5mm Grendel. Alexander’s Specially produced Bolts; Carriers; Barrel Extensions; & other parts.